Nintendo’s 2010 E3 press conference was an enticing event if you were a fan of the company’s eclectic stable of popular characters. The new Zelda game, Skyward Sword, finally got a public demonstration (even if its temperamental motion controls did have Shigeru Miyamoto glancing towards the heavens on more than one occasion), while Donkey Kong Country Returns looked like it was going to be more old skool fun than a barrel load of monkeys (and it was). Perhaps the most interesting announcement thought, was that everyone’s favourite little pink sucker, Kirby, was set for a comeback in an all new adventure that was going to be as retro as it was revolutionary. For reasons involving evil wizards and clothing-based portals between worlds that are perfectly reasonable in Kirby’s universe, our little ball-shaped buddy begins his Epic Yarn by being transported, against his will, from his home in Dream Land to Patch World. 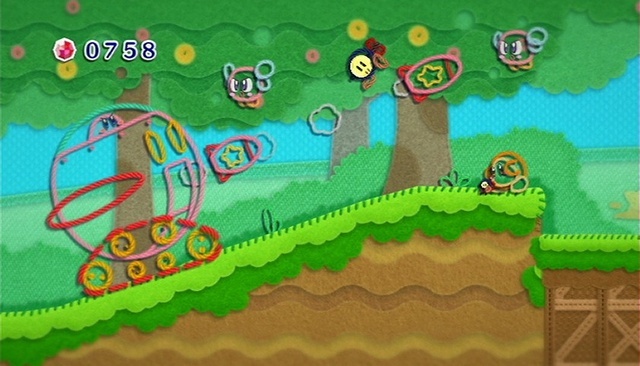 This inconvenient transition for Kirby however, is great news for players as Patch World is a fantastically fashioned land where everything is made of bits of crafting kit. From beads to buttons, felt to fibre and sequins to sewing thread, Patch Land is bursting at the seams with fabric-related fun and, of course, lots of things, Kirby included, made of yarn. Unfortunately for Kirby, this means that his trademark vacuum cleaner attack isn’t going to work on the enemies he encounters, but luckily the very nature of the world means that he can instead simply unravel foes turning them back into balls of thread. Kirby’s Patch Land powers don’t end there though, as he can make the most of his new found form by spinning himself into a whole host of different items. U.F.O’s dolphins, trains and fire engines all get Kirby-fied as the pink blob traverses Patch Land’s varying environments in his quest to get back home. 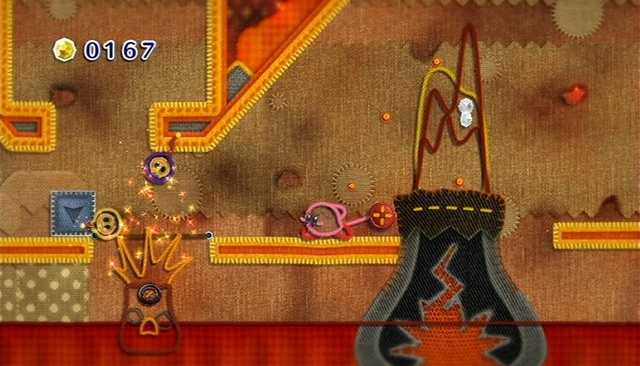 Behind the imaginative and delicate veil of Patch Land’s hobby craft aesthetics, Epic Yarn’s gameplay and level designs are those of an extremely traditional, side-scrolling 2D platformer. The Wii Remote’s motion controls are set to be used sparingly with the controller held sideways in ‘classic’ style, while Kirby will collect beads as he wanders through the world that will act as Epic Yarn’s version of Mario’s coins or, more closely, Sonic’s rings. It’s these beads that are one of the most interesting things about Epic Yarn, as they form an integral part of the title’s in-built difficulty. The game has obviously been designed to be accessible to younger players, as whilst getting hit by enemies means that you drop beads, even with none left it’s still impossible to die. For those whose ages are in double digits, the test comes in completing each level with as many beads as possible and earning a coveted gold award for their efforts. Trying to develop a game that’s so inclusive is something of a risky business, and Patch World will need to be a constantly surprising and appealing place to avoid Epic Yarn becoming a pleasant, but increasingly dull cake walk for hardened gamers. 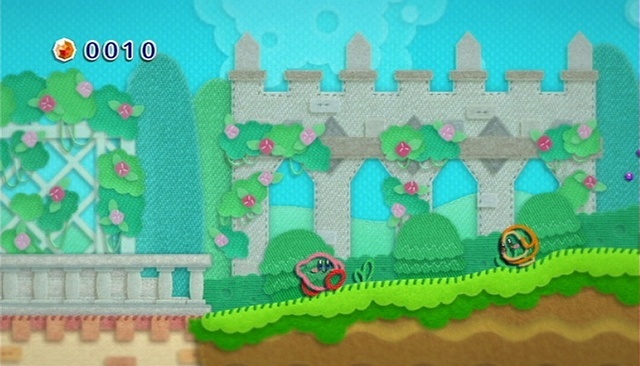 The co-op mode, where a second player can join in the entire story as Prince Fluff, is also a welcome addition. But once again, levels will need to be thoughtfully designed to provide as much or as little challenge for single players and duos of all abilities, without the kind of issues that cropped up in New Super Mario Bros. Wii. Kirby’s such a great character that he undoubtedly deserves a new outing of his own on the Wii, and fans will be hoping that his Epic Yarn will have everything sewn up. Does Europe not have this yet? No. KEY is currently scheduled for release here on 25th Feb 2011. Thanks Nintendo for once again treating us like the videogaming equivalent of the third world. Man that’s just rude, this game has already come and gone in NA… I’ve only heard good things about it though! Looking forward to this. Don’t you think kirby would make a good pokemon.